The ISM report provides some hints for the BLS report later this week, but it is important to remember that manufacturing employment is a small percentage of the overall work force. ISM’s Employment Index registered 56.1 per cent in February, which is 2.8 percentage points higher than the seasonally adjusted 53.3 per cent reported in January. This is the third month of growth in manufacturing employment, and the highest reading since January 2005 (58.7 per cent). An Employment Index above 49.8 per cent, over time, is generally consistent with an increase in the Bureau of labour Statistics (BLS) data on manufacturing employment. 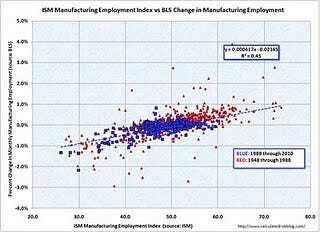 The following graph shows the ISM Manufacturing Employment Index vs. the BLS reported monthly change in manufacturing employment (as a per cent of manufacturing employment).Click on graph for larger image in new window. The graph includes data from 1948 through 2009. The earlier period (1948 – 1988) is in red, and the last 20 years is in blue. Clearly the ISM employment index is related to changes in BLS employment, however the relationship is noisy, and it appears a reading above 51.5 for the ISM employment index is consistent with an increase in the BLS data for manufacturing. Although there is significant variability, the current level of 56.1 per cent in February suggests around a 22,000 gain for manufacturing jobs.